Vince Heyer, Operations Manager for Hodge's Davenport Warehouse has been selected as the 3rd Recipient of the Annual Award. Dubuque, IA – Hodge has announced that Vince Heyer, Operations Manager of their Warehouse Operation located in Davenport, IA, has been selected as the 2018 recipient of the Ding Bell Service & Loyalty Award. The award is given to one individual annually who exemplifies outstanding service and loyalty to Hodge and its customers. Recipients of the Ding Bell Award are nominated by their co-workers and are then picked by a selection committee made up of Hodge employees. 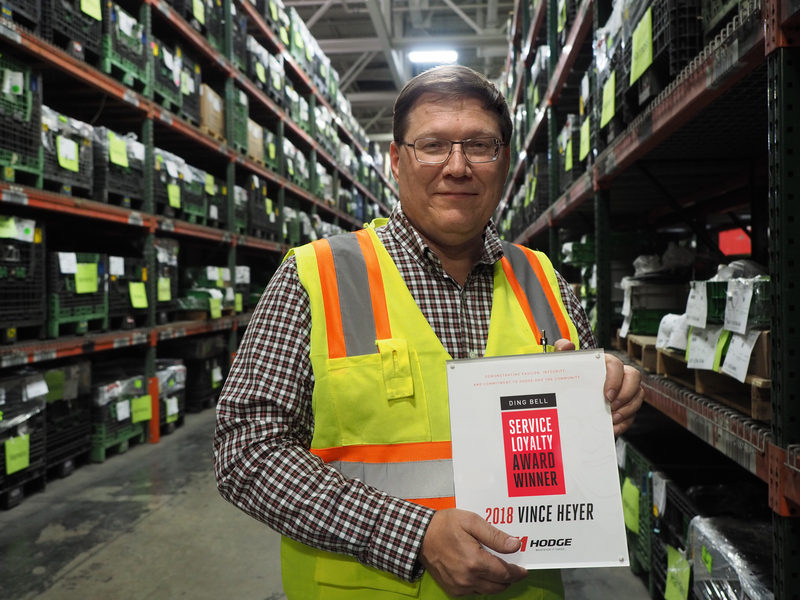 Vince Heyer joined Hodge in 2011 during a very pivotal time for their Davenport Warehouse Operation. In the midst of a software change with their customer that caused many line down challenges, the company needed a strong leader with a can-do attitude — Vince was exactly the individual Hodge needed. As Operations Manager, Vince rolled up his sleeves, kept a positive attitude and led the organization through major changes with daily challenges most would consider massive. As stated by this nominator, "Vince embodies the WHATEVER IT TAKES mentality and carries that attitude with him every day. His relentless focus on improving operations is evident in all those he encounters."